I have chosen a selection of work that touches on the ‘found’ theme to take and exhibit in the library to accompany the talk. ‘Ronnie’s Shoes’ present a moulded paper shoe, handmade box and Chap Book inspired by my brother’s child hood shoe. Originally conceived for the 2006 ‘Sitting Room’ exhibition of artists books, the found shoe was remodelled in glass, ceramics and finally paper, until the appropriate material suitable reflected the function of the object. Re-cycling and reusing found material is common within my practice and creative output, sometimes due to financial restraints and limited budgets, sometimes actively pursued . 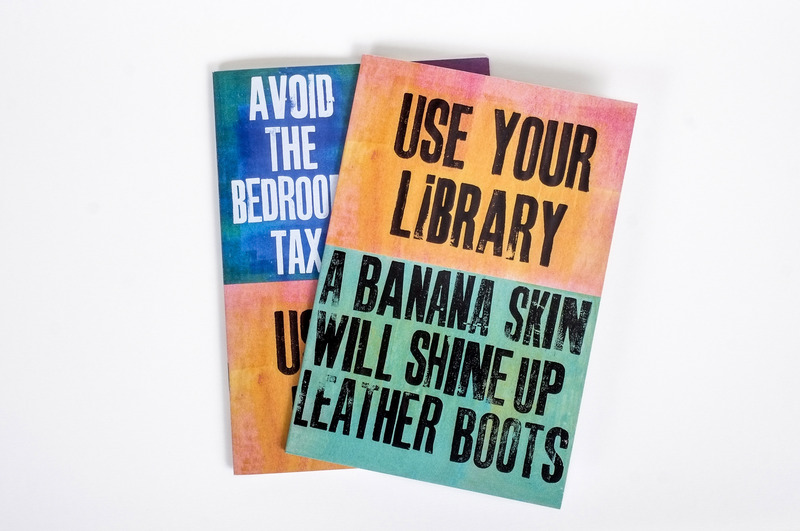 An ongoing project with Middlesbrough based Navigator North entitled Latest Edition has provided the opportunity to revisit a collection of thrifty tips produced at the 2013 Festival of Thrift with the visiting public. Over 150 Thrifty Tips were collected at this event and later re-configured into a series of stitched books. Latest Edition brings together a group of Northern based artists to make work, learn from each other and produce a body of work responding to the Festival ethos sighted at Kirkleatham Museum. For this touring exhibition I have re-configured the original Thrifty Tips into artists’ book using cable reels supplied by Middlesbrough’s based scrap project ‘Percy’s’ & local electrician Steve Votadini. Political activism and community engagement feature as a driving force in in my work. Emergency Anti-Trump fold out Protest Posters have been very well received at book fairs and artists book outlets. Printed in response to the imminent visit of Donald Trump to the UK, I have been actively campaigning to prevent such a visit, sighting Trump’s prejudice and annihilating force in a this practical zine with hand hints for placards and slogans.